Piezoresponse (Piezoforce) Microscopy (PFM) is a technique based on contact mode that maps out the inverse piezoelectric effect on a sample. 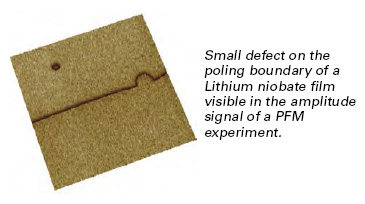 The sample is electrically stimulated and the topographic response of the sample is monitored using lock-in techniques. Amplitude and phase information reveal information about the strength and direction of the polarization on the sample. Hi, I am using a multimode 8 with adapted a nanoscope V for PFM measurements , I need to connect a external lock-in amplifier, in order to remove the surface electrostatic charge in the amplitude response ,could somebody please tell me the correct way to do it? can you email me specific contact information so we can send you information. Would you please give me some advice on how to conduct PFM on Dimension ICON AFM ? I will ask a technical support person from Bruker to contact you about this.